"Here!" cried Alice, quite forgetting in the flurry of the moment how large she had grown in the last few minutes, and she jumped up in such a hurry that she tipped over the jury-box with the edge of her skirt, upsetting all the jurymen on to the heads of the crowd below. and there they lay sprawling about, reminding her very much of a globe of gold-fish1 she had accidentally upset the week before. "Oh, I beg your pardon! "2 she exclaimed in a tone of great dismay, and began picking them up again as quickly as she could, for the accident of the gold-fish kept running in her head, and she had a vague sort of idea that they must be collected at once and put back in the jury-box, or they would die. "The trial cannot proceed," said the King, in a very grave voice, "until all the jurymen are back in their proper places  all," he repeated with great emphasis, looking hard at Alice as he said so. "Unimportant, of course, I meant," the King hastily said, and went on to himself in an under-tone, "important  unimportant  unimportant  important " as if he were trying which word sounded best. Some of the jury wrote it down "important," and some "unimportant." Alice could see this, as she was near enough to look over their slates: "but it doesn't matter a bit," she thought to herself. At this moment the King, who had been for some time busily writing in his note-book, called out "Silence! ", and read out from his book, "Rule Forty-two. All persons more than a mile6 high to leave the court." 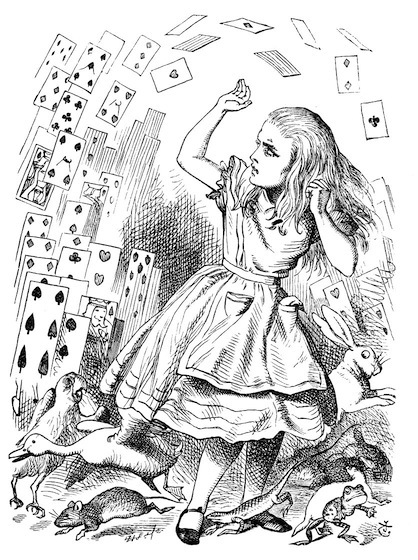 "Well, I sha'n't go, at any rate," said Alice: "besides, that's not a regular rule: you invented it just now." The King turned pale, and shut his note-book hastily. "Consider your verdict," he said to the jury, in a low, trembling voice. "I haven't opened it yet," said the White Rabbit; "but it seems to be a letter, written by the prisoner to  to somebody." "It isn't directed at all," said the White Rabbit: "in fact there's nothing written on the outside." He unfolded the paper as he spoke, and added "It isn't a letter after all: it's a set of verses." "That proves his guilt, of course," said the Queen: "so, off with  ." "That's the most important piece of evidence we've heard yet," said the King, rubbing his hands; "so now let the jury "
"If any of them can explain it," said Alice, (she had grown so large in the last few minutes that she wasn't a bit afraid of interrupting him12) "I'll give him sixpence.13 I don't believe there's an atom of meaning in it." The jury all wrote down, on their slates, "She doesn't believe there's an atom of meaning in it,"14 but none of them attempted to explain the paper. "If there's no meaning in it," said the King, "that saves a world of trouble, you know, as we needn't try to find any. And yet I don't know," he went on, spreading the verses on his knee, and looking at them with one eye; "I seem to see some meaning in them, after all. '  said I could not swim ' you ca'n't swim, can you?" he added, turning to the Knave. "All right, so far," said the King; and he went on muttering over the verses to himself: "'We know it to be true'  that's the jury, of course  'If she should push the matter on'  that must be the Queen  'What would become of you?' What indeed!  'I gave her one, they gave him two'  why, that must be what he did with the tarts, you know "
"But it goes on 'they all returned from him to you'," said Alice. "Why, there they are!" said the King triumphantly, pointing to the tarts on the table. "Nothing can be clearer than that. Then again  'before she had this fit'  you never had fits, my dear, I think?" he said to the Queen. "Then the words don't fit you," said the King, looking round the King with a smile. There was a dead silence. "No, no," said the Queen. "Sentence first  verdict afterwards." "Stuff and nonsense!" said Alice loudly. "The idea of having a sentence first!" "Hold your tongue! "18 said the Queen, turning purple. "Oh, I've had such a curious dream!" said Alice. And she told her sister, as well as she could remember them, all these strange Adventures of hers that you have just been reading about; and, when she had finished, her sister kissed her, and said "It was a curious dream, dear, certainly; but now run in to your tea: it's getting late." So Alice got up and ran off, thinking while she ran, as well she might, what a wonderful dream it had been. Gold fish, the ever popular denizens of clear glass fish bowls all over north america, are a species of carp from asia. Their popularity is related to their hardiness, although they don't tend to co-exist well with other sorts of fish in the confines of bowls or fish tanks. Gold fish will grow to fit their surroundings, so one that starts out as a tiny individual in a bowl will rapidly grow out into a not so cute fish in a larger tank. Their maximum size seems to be roughly 20 to 25 centimetres long, based on gold fish I have seen in wall tanks at fancier chinese restaurants. English has a small repertoire of stock phrases for those moments when we have small accidents or mishear someone, including 'beg your pardon', which is still in common use. 'Excuse me,' is another one. They are all variants on 'don't blame me for this, it was an accident' and can sometimes seem a bit senseless. If you have ever watched someone distractedly apologize to a mailbox or other inanimate object they've bumped into as they rush to get somewhere, that is an example. At this point the usefulness of writing their names on their slates should be clearer to both the Gryphon and Alice! It would be difficult for a lizard set into an approximately sitting position to look anywhere else in view of the structure of their heads. A lizard's head and neck still has many features in common with that of a fish, contemporary fish being contemporary lizards' distant cousins. An actual neck between head and shoulders was quite an evolutionary innovation, and many lizards still have the rough equivalent of an early version neck with little vertical flexibility, meaning they can move their heads easily and widely from side to side, but less so up and down. There is a great book that discusses the early evolution of flexible necks and limbs in fish related to amphibians. It is called Your Inner Fish by Neil Shubin. No doubt there is a fine art to correcting a king or other authority figure in a public place, especially when they have slipped off-script. 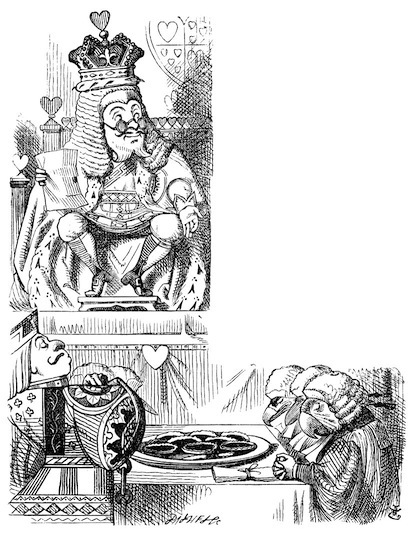 In the case of the King of Hearts, who appears to be perhaps a bit dunce-like after all, he would definitely be in trouble without the assistance of the fastidious White Rabbit. The mile in question being a british mile (about 1.6 kilometres), another remnant of the roman invasion of britian. The romans defined their mile on the basis of the distance a military unit marched in 1 000 paces. If the Knave didn't write the verses, how would he know? People have been signing documents for at least as long as there have been writing systems of some kind in use. The earliest 'signatures' were apparently made using carved seal-stones, stamps, or rings. Some of the most elaborate examples have been excavated in iraq and greece. When literacy was less common, a seal was an important work-around as a person didn't need to be able to read to use one, and they could be elaborated enough to make forgery difficult. An early sign of increased literacy and the legal ability of the poor to sign documents in their own right was the restriction of seals to the nobility, and the signing of documents with 'a mark,' usually an x with the person's name written in beside it by a notary. Is the White Rabbit trying to set the King up to say something else rather obvious and at least sensible? 'To give someone a good character' meant to vouch for a person's honesty and that they were indeed who they said they were. This was commonly done using letters of introduction in the victorian period, a time well before the proliferation of idenity cards, passports and the like. Arguably this is a more secure system in the longer term, if the recent misuses of personal documentation in the second world war and today in advertising are any indication. 'To have a fit' usually means 'to have a temper tantrum.' It was formerly used for many sorts of sudden, violent physical reactions, including epileptic attacks and cerebral hemorrhages or strokes. A character in older stories who suffers an 'apoplectic fit' has suffered a stroke that has rendered them at the least speechless, at worst dead. A person can be predisposed to strokes by high blood pressure, and emotion or exertion that causes a sharp rise in blood pressure can indeed cause a stroke. This led to the broadening of the use of the term 'apoplectic' to being rendered speechless with rage. Alice is finally finished with deferring to animals or people. 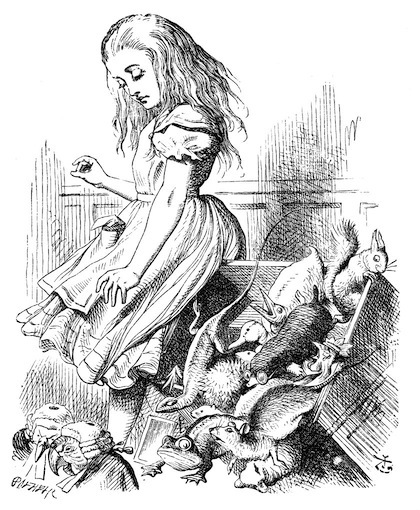 It is interesting that Alice never opts to use her bit of mushroom that causes growth to outgrow the other people and creatures she meets. Six pennies, or half a shilling, once a passable even if not generous tip for someone performing a menial task on behalf of someone else in victorian england. By the 1800s, the word 'atom' was barely 300 years old, and there was no real sense of an atom's size until 1865. Nevertheless, a surprising amount of information had been deduced from experiments with gases and collating information about different pure substances in the earliest versions of the periodic table. Poor Bill the Lizard, subject to a fit the Queen of Hearts denies she would ever have. An inkstand could be a small tray with recesses to hold several pens, and one or two bottles of ink. Expensive stands would have built in ink reservoirs and fancy finishes. A more humble sort of inkstand would have one ink bottle and a socket to set the pen in between uses. The pen stands in banks, now themselves almost completely vanished, are a much reduced version of these earier inkstands. The dip pen used with inkstands was commonly used right into the second world war, although inexpensive reservoir (better known as fountain) pens were commonly available. Unlike most types of ballpoint pen, reservoir and dip pens alike need to be applied to the paper with little or no pressure to make a mark. When well balanced, the likelihood of suffering writer's cramp while using them is quite low. Puns are popularly denounced as the lowest form of humour, which seems a bit unjust. The number of clever uses of puns in literature is quite impressive, and books like The Hitchhiker's Guide To The Galaxy are made up of almost nothing else, including visual as well as verbal puns. Overall I'm inclined to rank puns above toilet humour and fart noises, but no doubt there are plenty of people who would disagree with me. Not quite the twentieth time, although the King has called for the verdict quite often. I mentioned 'procedural fairness' previously, and in a court setting this tends to mean all the steps carried out to prevent a verdict being reached or acted on before the evidence of a crime has been tested and examined. Needless to say, there is little procedural fairness evident in this particular court room! 'To hold the tongue' is to keep quiet, as it is nearly impossible to speak while keeping your tongue still. It was a commonplace not so long ago that children 'should be seen and not heard' so in all likelihood the real Alice heard this order more than once from many of the adults she interacted with. The 'it's only a dream' explanation has been vastly overused, and in some cases imposed on a story that didn't have it originally, especially in the case of books remade as movies. A famous exmaple of this involving a popular children's book is MGM's version of The Wizard Of Oz by L. Frank Baum. The scriptwriters and director performed several unfortunate surgeries on the story, the revision of Dorothy's trip to Oz into a concussion-induced dream being one of the most obvious. Another change was the reduction of Dorothy from Baum's plucky original to a rather timid, snivelly child. This second change is especially obnoxious considering the fact that this was a groundbreaking characterization inspired in part by Baum's conversations with his mother-in-law Matilda Joslyn Gage, a prominent Feminist activist and scholar. In fact, Gage inspired the book, as described at the website of the Matilda Joslyn Gage Foundation. Annotator's Extra Note: Purists will notice that I have opted to leave off the last five paragraphs of Lewis Carroll's text. This is pure self-indulgence on my part, as I find those paragraphs an awful and unnecessary coda that lapses into the sentimental sludge Carroll had firmly mocked until then. They are also representative of the poorer examples of his work, which sadly includes almost all of his children's writing outside of the Alice books and The Hunting Of The Snark.